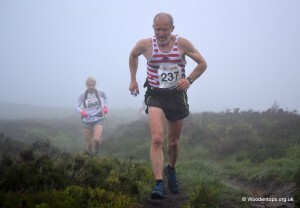 It was started by Allan Greenwood as the Churn Milk Joan race in 1999, renamed to Reservoir Bogs in 2002 and subsequently organised by Bill Johnson from 2004 to 2015. BM – 7.3 miles (11.7km)/1150ft (350m) – give or take! The route changed each year, with the map for that year being handed out at registration and the runners left to find their own way between the checkpoints. As Reservoir Bogs, the race has been won an impressive eight times (from 9 race starts) by James Logue. It has also been won by Nick Barrable (2002), Karl Gray (2003), Adam Breaks (2004), Simon Bourne (2009), Tom Brunt (2011) and Joe Crossfield (2013). Female winners of Reservoir Bogs were: Jo Smith/Buckley (2002 & 2005), Anne Johnson (2003), Carole Waterhouse (2004), Tracey Woodyard (2006), Gayle Benson/Sugden (four times), Jackie Scarf (2008 & 2014) and Heather Gardner (three times). In the 14 years as Reservoir Bogs, CVFR were first men’s team 9 times and first women’s team 8 times, Todmorden were first men’s team 4 times and women’s 3 times, and Leicester Owls were first men’s team once and women’s team twice. Springfield Striders are the only other team winners (women 2006). Race entry numbers ranged from 55 (2012) to 101 (2013).